Enjoy living at Carlyle Placesubmitted by Richard B. - May 15, 2017 |Recommended: YesWe spouse and self like living in Carlyle Place very much, very comfortable and secure. Gym needs more attention, cleaning and equipment maintenance, and would like to have real milk return to the coffee bar in the morning. A good place to live also the management all of them .helpful and kindsubmitted by Liyuwork K. - May 13, 2017 |Recommended: YesThe best convinence place. Carlyle Place is a great property submitted by Erin G. - Feb 21, 2017 |Recommended: YesLived here for about a year now and have just renewed for additional months because our first year experience has been great. The people are great, they're friendly and professional. The grounds are always clean, maintenance orders are thoroughly completed and extremely swift. If you're worried about noise, don't be we've heard nothing from our neighbors and its quiet for the most part. Package delivery system is such a great compliment for guests who aren't available to sign for their packages. The surrounding area of Old Town has everything you could ever need in walking distant and public transport is readily available. Safety has never been an issue at night or during the day. As far as complaints, one of which is out of the hands of those at Carlyle Place, is the ongoing construction next door for the Science building. During business hours it can get a little noisy but I'm sure that will come to an end soon. And finally, I wish they didn't have popcorn ceilings. Not totally an eye sore, just knit picking. Spacious and isolatedsubmitted by Caroline A. - Jan 15, 2017 |Recommended: YesI would tell anyone, if they have hesitation about living in an apartment because they are worried about the noise associated with apartments. 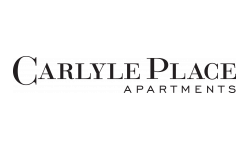 To not worry about that here at Carlyle Place, it has the feel of isolation and yet the apartment convenience. Good, convienient. Looking a little dated.submitted by Ronald P. - Oct 01, 2016 |Recommended: YesGood place. Nice. Good Management team. Friendly staff. Wonderfulsubmitted by Kirsten H. - Sep 14, 2016 |Recommended: YesI love living here. Staff are all kind and courteous. Maintenance come promptly and always completely correct any issues. Can't hear ANY of my neighbors. Great unit, fixtures are nice and up to date.I couldn't be happier with Carlyle Place. Excellent experiencesubmitted by Dorianne A. - May 25, 2016 |Recommended: YesWonderful place, awesome staff. Great place to live with a professional and helpful staff onsite.submitted by Timothy B. - Jan 05, 2016 |Recommended: YesCarlyle place has been a great place to live, I've stayed eight great years in this community. The staff takes great care of the facilities, the hallways and common areas are always clean and well kept. The floor plans of the apartments are well thought out and offer an above average amount of closet and storage space. The HVAC units are a bit noisy and you can hear some noise from the neighbors from time to time. The recent change over to a smoke free building is a very welcome change, I wish it had been that way since I moved in. Clean, Comfortable and Convenient submitted by Audrey D. - Dec 05, 2015 |Recommended: YesReally enjoy living at Carlyle Place. Location is great, parking in the building is good and apartments are very spacious. Good place to livesubmitted by Kevin P. - Nov 06, 2015 |Recommended: YesNice new building, nice staff, reasonable price for area, more and more shops coming available, awesome convenience with metro station 1 block away. Some train noise from metro outside. Love it here. submitted by Alec P. - Nov 05, 2015 |Recommended: YesA great location as well as great accommodations. Especially since the grills have been put in. Clean, well kept and very friendly. Apartments that feel like a true home.